When I entered a snow-covered military base in Tallinn, Estonia, on a crisp winter morning to do interviews on cyberwarfare, I didn’t expect the fourth Die Hard movie to be part of my research. “The movie came out more than 10 years ago, so you’d expect it to be outdated, but its depiction of cyberwarfare is actually very realistic,” said Siim Alatalu, a Strategy Researcher at the NATO Cooperative Cyber Defence Centre of Excellence (CCDCOE). Wait… Live Free or Die Hard, a movie where John McClane battles a fighter jet with a semi truck, is realistic? Cyberwarfare is something we’ve all seen in movies — like Die Hard — but most of us don’t fully grasp it. How’s it different to conventional warfare? How do you train and prepare for cyberattacks? Is this really something we need to worry about and what does the future hold? That’s what I hoped to learn more about at the CCDCOE. I wasn’t allowed to take pictures, but luckily the CCDCOE supplied me with a cool picture of the facility. Cyberwarfare is changing the nature and scope of conflict, as it goes so far beyond ‘cyber’ and actually touches peoples’ lives. That’s why nations need to be alert and prepared for attacks. It can be difficult, as cyberwarfare can affect almost every aspect of civilian life and technology. As such, Alatalu says a big part of dealing with crisis is simply having a good answer to the question: who are you gonna call? Well, it certainly isn’t the Ghostbusters. But as you can see from the intense video of last year’s exercise, there’s a lot more going on than just pizza and coke. Locked Shields is a massive defensive exercise that enables cyber security experts to enhance their skills in defending national IT systems and critical infrastructure under real-time attacks. It’s technically not ‘in Tallinn,’ as each member nation of CCDCOE forms a Blue Team in its own country to best simulate real situations. The Blue Teams then get two days to defend against over 2,500 attacks, spread across 4,000 systems, carried out by the Red Team based in the CCDCOE in Tallinn. One of the few things I was allowed to take a picture of: Replication of a power grid used for drills with real connection hardware, although it’s mostly a cool shiny prop for visitors like myself. Locked Shields also makes sure to show just how powerful attacking positions can be when exploiting vulnerabilities. There’s only one Red Team going against 20 or so Blue Teams, but the Red Team has a few months to prepare and has its own exercise, Crossed Swords, to hone its skills. The defending teams, however, need to react in real-time. The Red Team also has experts from companies that support the drill — like Siemens and Ericsson — which attack the same systems they helped to create. What’s interesting about the exercise is it involves protecting many of the same targets that were attacked in Die Hard (I guess it really is a perfect example). Cyber military officials learn how to deal with threats with the help of civilian experts who know the systems inside out. This is incredibly important as the scale of cyberwarfare makes coordination one of the key defensive qualities. So when an attack comes, all the members of CCDCOE will know exactly who to bring to the table and how to defend their services. But do we really need to be so paranoid? Sure the US, China, and Russia might be hacking each other, but do other countries need to worry at all? Estonia knows better than anyone that it isn’t just the bigger countries that need to worry about cyberattacks. Back in 2007, Estonia was hit with a brazen cyberattack which targeted foundational websites of Estonian society, like sites of parliament, banks, ministries, newspapers, and broadcasters. Journalists couldn’t publish articles, ATMs stopped working, and government agencies couldn’t communicate. The attack, which has been referred to as the world’s first cyberwar, came after a dispute due to Estonia’s decision to relocate a statue of a Red Army soldier in Tallinn — something Russia didn’t like. Although it’s never been proved, the general consensus is that the Kremlin was behind the attack — making it a watershed moment in the history of warfare. “All of a sudden you had a nation state being cyberattacked by another nation state,” says Alatalu. He clarifies that it wasn’t an ‘attack’ in the legal sense, as it wasn’t covered by international law of armed conflict, but the effects of the aggression were truly felt by Estonians. Siim Alatalu (right) welcoming the Romanian Foreign Affairs Minister at CCDCOE. Up until that point, Alatalu says that Estonia had been trying to bring up the importance of preparing for cyberwarfare with fellow NATO members, but wasn’t met with much enthusiasm or understanding. But this all changed with the 2007 cyberattack on Estonia. NATO and other nations around the world woke up to the direction conflict was taking and started following Estonia’s lead. CCDCOE was established in 2008 in Tallinn, partly due to Estonia’s tech-minded approach, and quickly grew in size — currently improving cyberdefenses of 21 countries around the world. Even though it required a big change in how countries think about defense and new exercises like Locked Shields, cyberwarfare is still very much based on what every conflict in the last thousands of years has been built on: humans. “Cyberwarfare eventually comes down to the human brain. Fortunately, it still requires a human to operate all the code and launch attacks,” says Alatalu. Tactics, targets, and intent are still shaped by humans, and we can therefore adapt and defend against them. The NotPetya attack of 2017, which disrupted services spanning from Chernobyl’s radiation detection system to US hospitals, was for example targeted against Ukraine — just like the attacks against Estonia a decade earlier. Motivations and executions were all shaped by the human brain to begin with; the only difference is the effects weren’t contained to the intended target as the level of global connectivity was much more intense — making the attack felt all around the world. “But all of this might change as we might be looking at a totally new balance when artificial intelligence really kicks in,” says Alatalu. AI is beginning to revolutionize almost every aspect of our lives, so it makes sense it might change cyberwarfare as well. But seeing that AI can come up with solutions and approaches completely different to humans — like AlphaZero’s ‘alien’ chess — does that mean we might see ‘alien’ warfare in the future? “I’d prefer not to think about this possibility,” Alatalu answers earnestly. But it’s clear to him that when AI really enters cyberwarfare, whoever has the best AI will have a significant advantage. Adaptation seems to be the key, and countries cannot be slow to adjust like at the beginning of the cyberwarfare era. 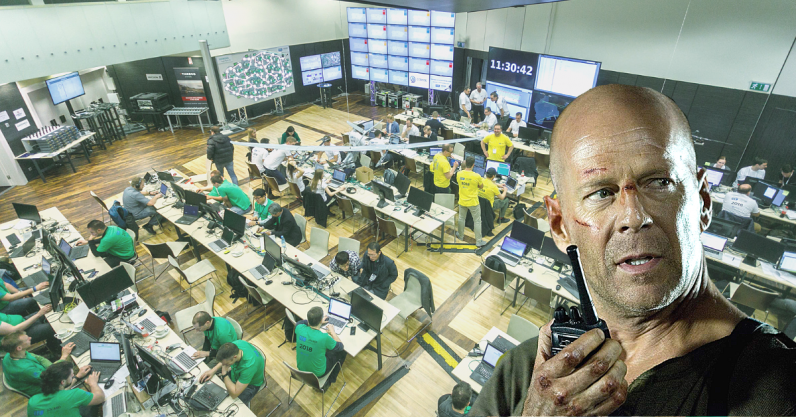 With increased global connectivity and technological development, we have to be ready for any type of cyberthreat and we’ll continually have to update our defenses — we can’t just count on John McClane to save the day. Read next: CHEAP: Forget AirPower, this Anker Wireless charging pad is 35% off!! !